The Nordic countries, like much of Europe, has been experiencing a very warm spring and summer with long periods of hot, dry weather this year. If you thought Sweden, Finland and Norway were always cold and snowy, think again! 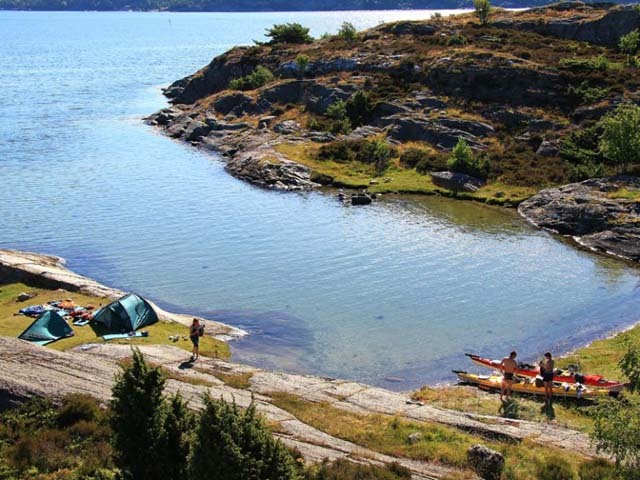 While the glorious sunshine is wonderful in many ways for enjoying a trip in the outdoors (especially for our canoe tours or kayaking tours, where a refreshing dip in the lake, river or archipelago waters is always only a paddle-length away! ), when it comes to bedtime, keeping cool and getting a good night’s sleep when it’s 30 degrees outside can be a challenge. 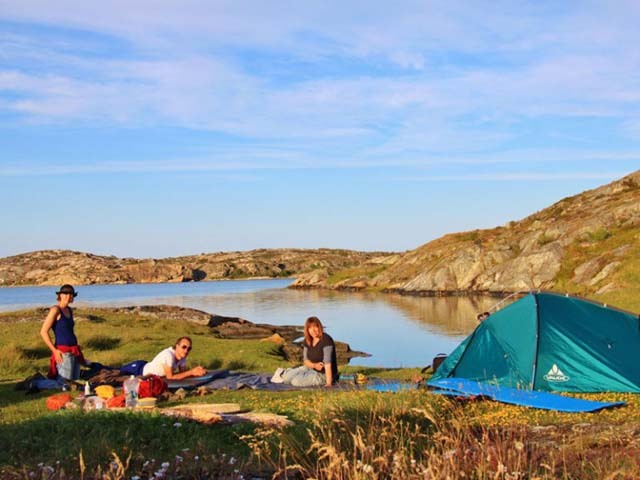 Spend some time choosing the best location for your tent to maximise shade and through breezes – pitching close to the water may offer a cooling effect from air blowing over the surface, though you should also consider how proximity to water may affect exposure to mosquitoes in the evening. Camping in Bergslagen in the west of Sweden. Photo: Euan Turner. In the Nordic countries during summertime, the hours of daylight are very long – even in the south it will hardly get dark at all in June and July, while in the far north it is of course Midnight Sun, when the sun will be up 24 hours a day. 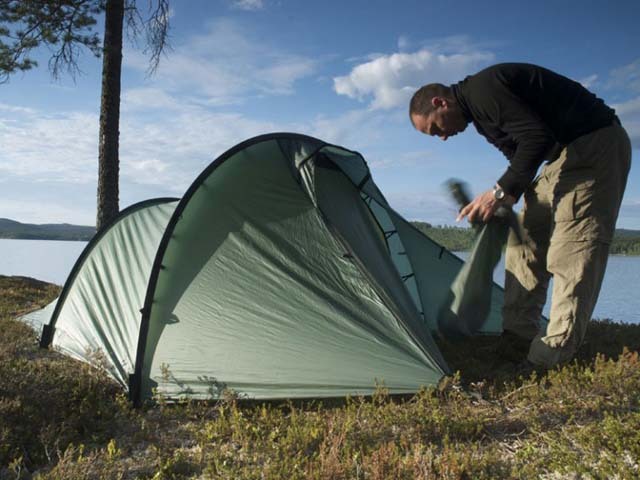 This means that differences between nighttime and daytime temperatures may be negligible during the peak summer period, but it’s still helpful to consider how the shadows move and how you can position your tent so that it will be as shady as possible during sleeping hours and also in the path of any cooling breezes. If you can, leave it until evening to pitch your tent to minimise the tent heating up in the sunshine before bedtime. The summer evenings are light and long. Photo: Euan Turner. 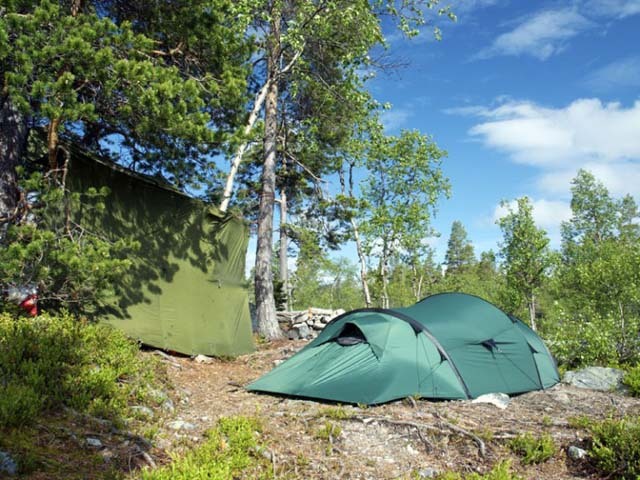 If the terrain allows, a tarpaulin pitched above the tent (tied to a tree, for example) can provide extra protection from direct sunlight. Just be sure to leave space for air to flow between the tarp and tent and again, think about how the shadows move. Depending on the design of your tent, if it has a separate inner sheet and flysheet, it might be beneficial to try sleeping with just the inner tent (maybe with a tarp above as in Tip 2). In any case, make sure you make maximum use of the tent’s vents to provide air-flow. Don’t be tempted to leave the mosquito netting open, though – you won’t want to share your tent with the little beasties! Swedish summers can be long and hot! Photo: Jed Richards. Just as in winter, when to stay warm during the night you need to go to bed warm, so in summer going to bed cool will help. Take a dip just before bedtime and make sure you’re nice and cool (including getting nice cold feet) before settling down. 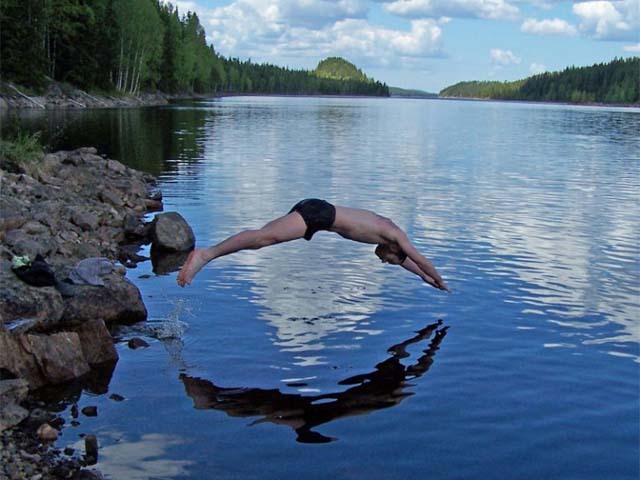 Taking a dip is a great way to stay cool when camping. Photo: Bob Carter Nature Travels. 5. To clothe or not to clothe? There are mixed views on this point, but some say that sleeping with a light layer of clothing (loose-fitting cotton, for example) can keep you cooler than sleeping without clothes, as the clothing will wick sweat away from your body during the night. If you have a cotton sleeping bag liner, you could also try sleeping without clothes and with just the liner. 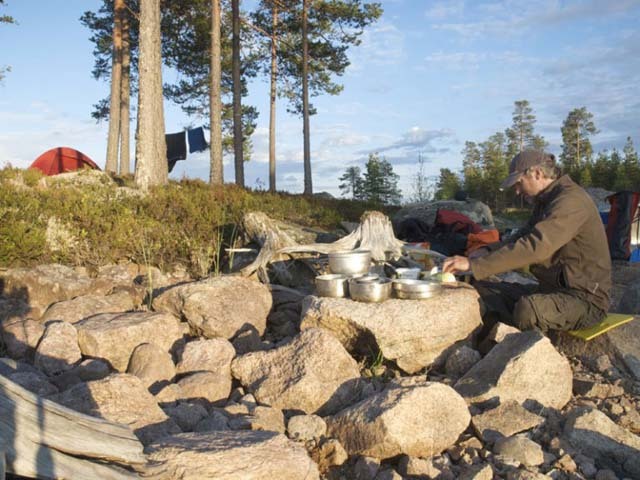 Camping and kayaking on Sweden’s west coast. Photo: Jed Richards. You may find it comfortable to dampen a towel or sheet to place over you when sleeping. Don’t make it too wet – it shouldn’t make the tent or bedding damp (bear in mind it might be cold and raining when you wake up the next morning!) and of course don’t get anything wet that you might wish you had dry later in the tour if the weather changes (such as your sleeping bag liner). Instead of placing it over you, you can also hang a t-shirt or towel over one of the air vents in the direction where a breeze will blow into the tent, where the air blowing through will be cooled by the cloth. Choose a shady spot to pitch your tent. Photo: Euan Turner. The opposite of a winter hot water bottle, you could also try a summer cold water bottle! Fill it with the coldest river, lake or sea water you can find just before bedtime and put it at the bottom of your sleeping bag or liner. If you haven’t brought a “proper” hot water bottle on the trip (which you probably haven’t) try a drinking water bottle, but make sure of course there’s no chance of leakage during the night. In winter you’d be recommended to have a hot drink before bedtime. In summer, have a drink of cold water, which will help to keep you cool and also hydrated during the night. Not too much though – you don’t want a 3am visit to the forest interrupting your sleep! Drinking plenty of water is especially important in hot weather. Photo: Nature Travels. It’s important to keep yourself cool and comfortable, but of course you will also want to keep any food items and drinks as cool as possible during your trip. Use a plastic or waterproof bag and put the items securely inside. Unless the bag is fully waterproof, check any food packaging won’t be damaged by water. Then find a patch of cold water in the river, lake or sea out of direct sunlight and put the bag in the water to keep cool overnight. Take care to anchor the bag very securely so that it cannot float away, get washed away or blown away in the wind – otherwise you’ll have no food in the morning and you’ll be littering as well! Use heavy stones on top of the bag and/or tie it securely to a bush or branch. 10. The light! The light! It’s not only the heat that may keep you awake on a summer trip in the Nordic countries – the light will also interfere with your sleeping rhythms. A sleeping mask (save one from your next long-haul flight) can help with this, as can ear-plugs to soften the sound of those early-morning birdies. We hope we’ve given you a few ideas to stay cool on your outdoor adventures this summer. If you have more tips of your own, please let us know – we’d love to hear from you! 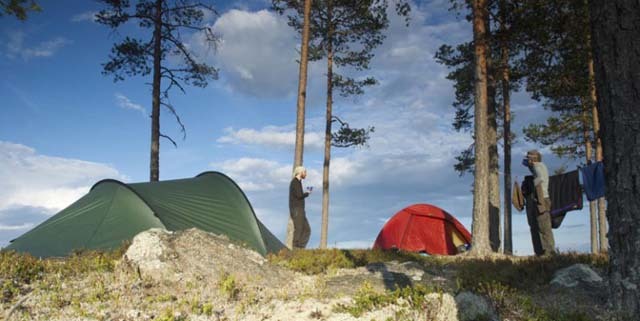 Best wishes for a glorious summer exploring the wilds of Sweden, Finland and Norway!